Happy 2019! I’m really off to a late start this year thanks to a lot of non-edible stuff happening in my life. Some of it involves saying goodbye to one canine family member and hello to a new one. As you long-time readers know, I consider this a “blog” in its original meaning of “web log:” An online account of my life, especially, but not exclusively, the part of it that takes place in my kitchen. Many of you have seen my daughter grow from a 9-year old child to a senior in college and have been here with me as I went through everything from cursed vacations to cancer. Skip the Dogs, Take Me to the Cooking! For those of you who are still with me, I have to break the sad news that we lost Bandit in November. There’s no easy way to describe what happened, but it boils down to he was staying with a sitter, got out of the yard, and was attacked and killed by at least one other dog. As you can imagine, we were grief-stricken and traumatized. I couldn’t fully enjoy the holidays because of the pain of losing him and the thought of what he must have suffered. This wasn’t the kind of news I wanted to burden my readers with right in the middle of the holidays, so I didn’t mention his death in my newsletter. I still can’t write about him without breaking down. Salem was a stray on the streets of Texarkana (sounds like the beginning of a country and western song!) We don’t know anything about his background, but the vet that examined his teeth estimated him to be around five years old. He was definitely somebody’s baby at one time because he’s fully housebroken, knows what a pet door is for, and will sit and offer his paw on command. 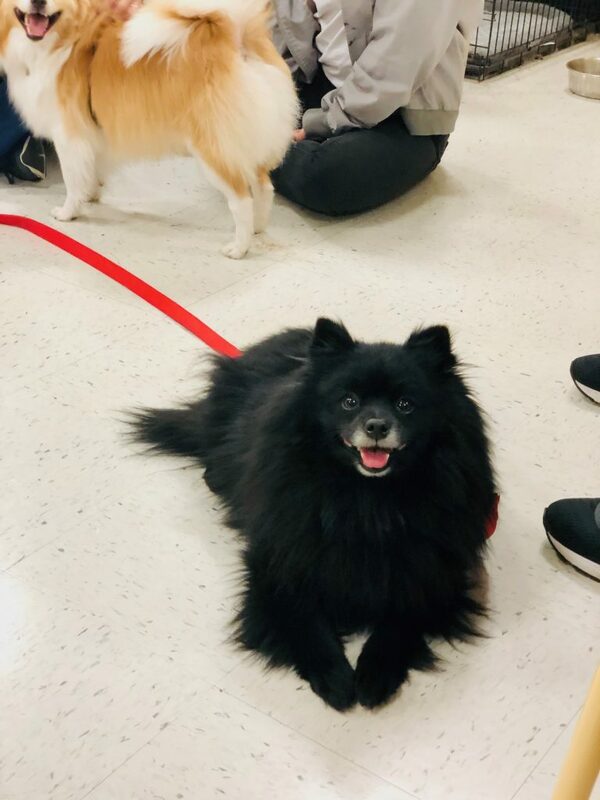 He loves long walks and treats (too much) and has a few pounds to lose to be in better health. Foxley, after some initial jealousy, LOVES him and can’t stop licking him. He’s been a wonderful addition to our household. I’ll now get to the business at hand, making these easy pretzels. First a confession that is going to irritate some people: For the past year, I have been following Weight Watchers. I don’t talk about it because I don’t want to endorse it or any other diet, but I’m not going to apologize for it, either. I’m doing what works for me to regain my health when nothing else did. I’m down 55 pounds and 30 cholesterol points and back to a regular blood pressure. It’s been easy to do as a vegan and works well with whole-foods plant-based eating. Anyway, if you wondered why I’ve been putting Weight Watchers points on recipes and started a category for Zero Point Recipes, that’s why. Because if this, I’ve been hanging out in Weight Watchers groups and learning some of the standard “low-points” recipes. 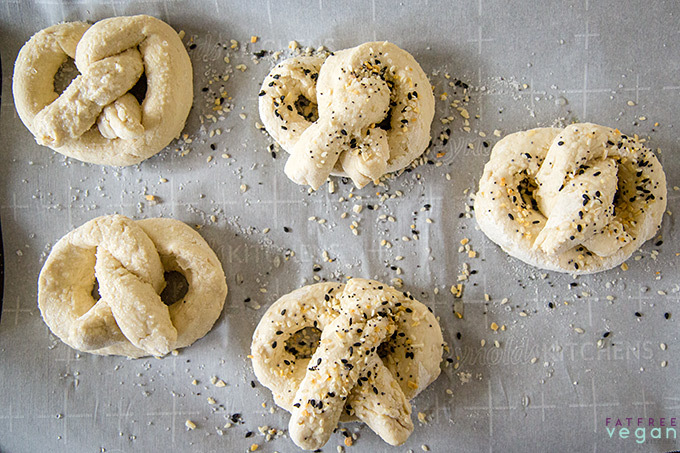 One of them is a 2-ingredient dough that can be used to make bagels, pizza crust, and pretzels. The non-vegan version uses self-rising flour and fat-free yogurt. On WW, fat-free yogurt is a “free” food, meaning you don’t have to count it toward the points you’re allowed each day. There is no corresponding vegan yogurt that’s fat-free, so vegans often substitute silken tofu, which is also zero points. 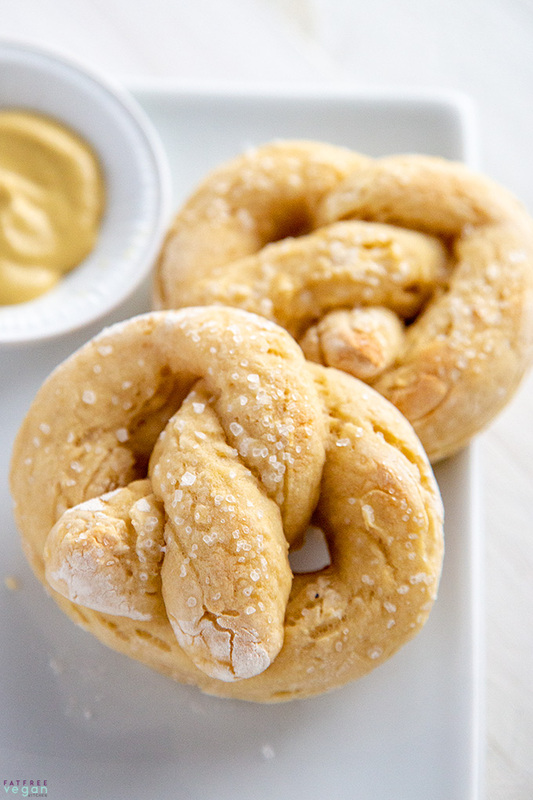 I decided to try substituting silken tofu in this pretzel recipe, and it worked great. Now, before someone jumps in to tell me, yes, real pretzels are yeast-raised; these baking powder pretzels are a quick bread, and because of that their flavor may be more like a biscuit than a traditional bread. But they were delicious enough for me to consider them a real treat. And vegan Weight Watchers will be interested in knowing that each vegan soft pretzel is 3 points. Making these pretzels is pretty simple, but to guide you through the process, I took photos of each step. First, blend the tofu with a little lemon juice (exact amounts are in the recipe below) until it’s completely smooth. The lemon juice adds some of the tanginess that yogurt would have and silken tofu doesn’t. I used a food processor because I thought getting the tofu mixture out would be easier than from the container of my Vitamix. 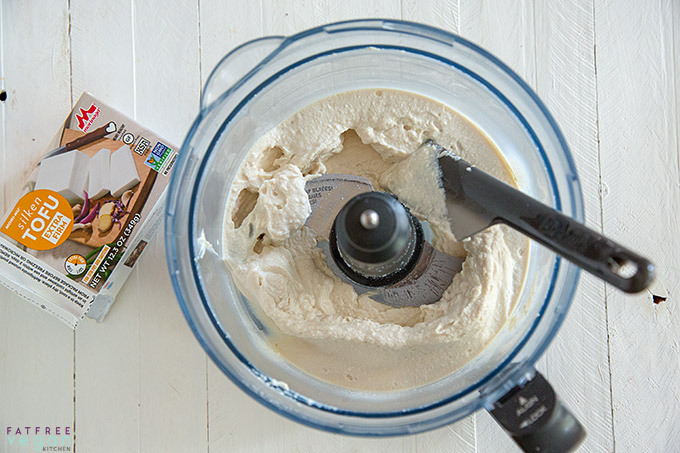 Next time I will use my Vitamix to get it silky smooth without the starting, stopping, scraping down, and repeating that I needed to do in my food processor. Pour the blended tofu into a bowl and add the flour (self-rising or a mix as noted in the recipe below.) Mix it well, turn it out onto a floured board, and kneed a few times until it sticks together. Cut it into 5 equal pieces. 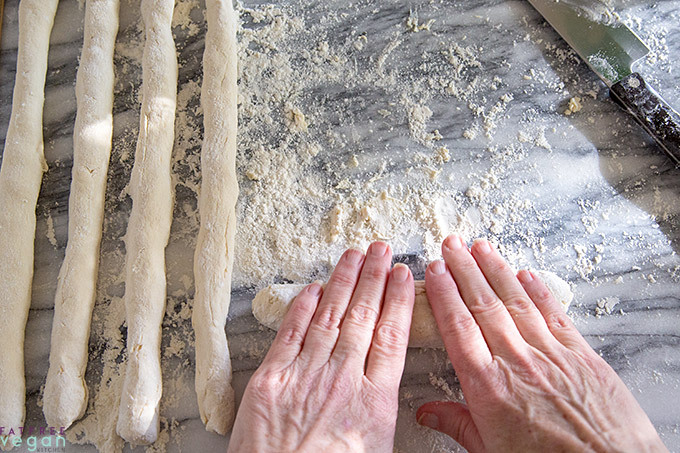 Roll each piece of dough between your hands to form 5 ropes of dough between 12 and 14-inches long. Place the pretzels on a parchment-covered baking sheet. Brush each one with a little aquafaba (liquid from cooked or canned chickpeas) and sprinkle with coarse salt or Everything Bagel Sesame Seasoning. Bake in a preheated oven as directed below. At the end of the baking, turn your oven to broil to slightly brown the tops and watch constantly . Don’t leave or they may burn! 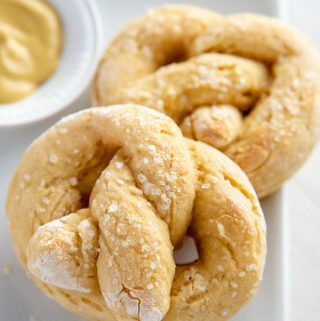 Serve with mustard or your favorite pretzel condiment! I used unbleached white flour with baking powder and salt added, but you can make these even more easily by using self-rising flour. I’ve included instructions for both. White whole wheat flour may also work, but I haven’t tested them using it. 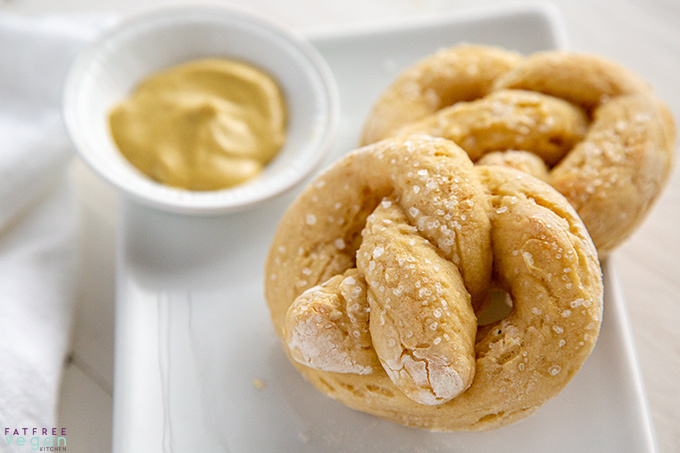 In less than an hour, you can be enjoying these light, oil-free pretzels. They're the perfect snack for Weight Watchers or any low-fat vegan diet. Place the flour in a mixing bowl. If you're using plain flour, add the baking powder and salt and mix thoroughly. Pour in the tofu mixture and mix until a soft dough forms. Turn the dough out onto a floured board and knead gently about 10 times or until the dough holds together. Divide it into 5 equal pieces. 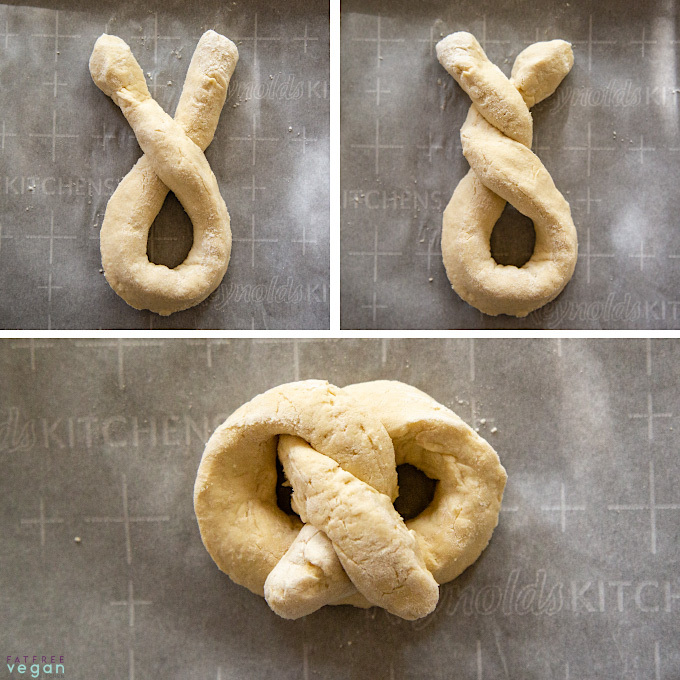 Form the rope of dough into a pretzel shape (see photo above) and place it on a baking sheet lined with parchment paper. Repeat with all the pieces of dough. Brush the tops lightly with aquafaba and sprinkle with coarse salt or Everything Bagel seasoning. Bake at 350F for 22-25 minutes. Then, leaving the pretzels in the oven, turn the oven to broil and WATCH THEM until the tops begin to lightly brown, 2-3 minutes. Be careful not to burn them. Remove from oven and serve warm. Refrigerate any leftovers. May be reheated in a toaster oven. Using silken tofu, each pretzel is 3 points on Weight Watchers Freestyle program. Using yogurt will increase points, calories, and fat. I baked the pretzels on the Bake setting in my Breville Smart Oven Air. The air fryer setting might also have worked. If anyone tries air frying them, please let me know what settings worked for you. 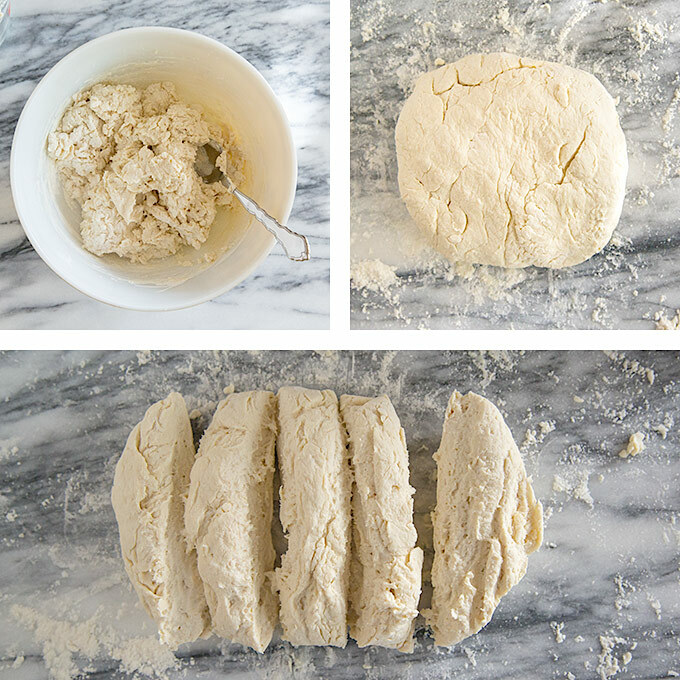 I’m eager to try this dough as a pizza crust and perhaps as a bagel or bun. I’ll update the post to let you know how that goes. I participate in Amazon’s affiliate program; if you buy something through one of my links, I may receive a small commission. I’m not affiliated with Weight Watchers in any way, other than being a paying customer. Looks amazing! Thank you. Glad you found a new family member! He looks adorable. Thank you! He’s a sweetie! Oh Susan, I keep an eye on your blog and your IG while others come and go. Yours is the site I always offer when newbies come to me about vegetarian recipes. And I am getting ready to restart ww because it’s the only thing that ever worked for me. I appreciate you so much. Aww, thanks, Amy! Good luck with ww. I really like the structure of it, though I know it’s not for everyone. So sad about you losing Bandit. I’m glad you found a new friend to pamper. We’ve been plant based for about 2 1/2 years, and I’m always collecting recipes I think may work for us. These look like a great snack. These look wonderful. Just printed out the recipe and going to try making them right now. I am so sorry to hear about your baby. These little pups leave such large holes when they go. Glad you found a new family member and a rescue at that! Love the blog, the pups, the daughter and the recipes. Thanks for sharing all of it so generously and authentically. Thank you, Susan! It makes me so happy when people enjoy the whole blog post, not just the recipe. These look amazing. Do you have a sub for the aquafaba as my son is allergic to legumes. You could try a plant milk or a little bit of corn starch mixed with water. It helps stick the salt to the top and promotes browning. Isn’t the tofu a problem for him too? What could be used instead? Never apologize for what you need to do for you (unless you tell us you are no longer vegan and then I’ll have an issue 😳😁). I have also been doing WW for almost a year and lost 40 lbs and feel great. I needed a control on my portions more than anything. Anyway, I have appreciated your point counts. Congrats on your success! Ha! No chance that I’ll ever not be vegan. I just don’t have it in me to eat an animal or something that came out of one. Congratulations on your success, too! Portion control is exactly what I needed. I didn’t realize how many extra servings of EVERYTHING I was eating until I started to count them. Exactly…to both never eating animals again and to how many 2nds and 3rds I had before!! Your dog got attacked by what? Feral dogs? Where do you live? I want to avoid that. From the autopsy report, yes it looks like feral dogs. (He got out as a result of an intruder breaking into the yard, so there was an investigation.) This was in Jackson, MS, but from what I hear, there are feral dogs in many places. Scary for us small dog owners! My daughters LOVE pretzels, so I know what I’ll be making for their after-school snack tomorrow. Thanks so much, Susan! Congrats on the new pooch, and the weight loss. I am also on those FB WW groups, to support my wife, who has lost roughly 40 pounds in the past year on WW, since I do all the cooking, and I was caught off-guard when I saw your name pop up in that setting. She’d fallen back into eggs-as-free-points and other such non-vegan (and less healthy) things, so I’m on the prowl for points-friendly PBWF options for her instead. Glad to see the intersection between your blog and WW, proving it can be done! Hi Scott! Please give your wife my regards and encouragement. Are you on the vegan weight watchers’ Facebook page? I’ll have to look for you there. I’ve learned a lot from that group. I did WW about ten years ago when I was still consuming egggs and dairy and I lost 33 pounds. I have considered going back to it as a vegan but am afraid it won’t work. Could you maybe post a daily menu of what you eat? It would be so helpful! They’ve changed the plan a lot lately, and it can be as healthy or unhealthy as you make it. The healthy part is all fresh fruit and non-starchy vegetables and beans are zero points (except avocado, because of the fat.) If I wanted to, I could go a whole day without eating any points, but they don;t encourage that. The points come from processed foods like soy milk, bread, potatoes and grains, and anything in a package. My typical day looks like this: I’m not a breakfast eater, so I have coffee with soy milk (a habit I haven’t given up) and sometimes a banana, grapefruit, or other fruit. Lunch varies. Most days I have a sandwich or wrap with chickpea salad or other sandwich filling. When I’m being very “good” I have a big salad with beans on it. When I have time to plan ahead, I make a big pot of my Instant Pot Vegetable Soup (1 point per bowl) and have that for a few lunches. I try to keep the points under 8 so I can have a nice dinner with potatoes or grain and a bean or tofu dish. I eat a lot of lentil or split pea soup this time of year! I’m so sorry about Bandit and the trauma and sadness – but congratulations on Sa1em! A rea1 sweetie pie, by the sounds of it. I can’t wait to make these! By the way, you 1ook amazing!! Congrats on your WW success! I have been with you for a 1ong 1ong time and your b1og is abso1ute1y my favorite and a1ways wi11 be. You are so fantastica11y genuine. thank you for a11 you do! Thanks, Maria! I would love to see you experiment with this recipe! I’ve been using basically this recipe to make vegan gluten free French bread. I use Kite Hill almond yogurt, brown rice flour, and xanthan gum. Then form all the dough into a small French loaf and bake it for about 45 minutes. Measurements 1 Cup Bob’s Red Mill brown rice flour (brown rice flour is heavier than wheat flour when measured by volume, if weighing should be 120 to 130 grams), 2 tablespoons tapioca flour, 1 teaspoon xanthan gum. 3/4 cup Kite Hill plain unsweetened almond yougurt (may need slightly more if the dough is very dry), 1-1/2 teaspoon baking powder, half teaspoon kosher salt. Brush the top of the loaf with a little aquafaba or if ok with added oil a tiny amount of olive oil. Yogurt is higher in fat. I’ve been limiting my soy intake because of some sensitivities. I think the tofu option would work well with this also. This sounds wonderful! Just last night I was wishing I had French bread. I’ll have to give it a try. For a larger loaf, I would double the ingredients. We live at almost 5 thousand feet so I bake bread at 375 F instead of 350 F. Especially with gluten free, vegan breads I use a instant read thermometer to check that it’s done. I like it to read at least 200F. I am going to try making the pretzels with my version of this dough, (may even use the tofu option if I think I can use that much soy without itching). Maybe as a super bowl snack (we are Patriots fans, and yes the Saints were robbed, couldn’t believe how bad the officiating was during that game). Hey Susan. Welcome back. I am so sorry to hear about your heartbreak for dear Bandit. Gorgeous Salem will be just as lucky to be part of your family. I too remember when E was little, check your blog every day, regularly make many of your great recipes, and feel like you and your readers are going through life together. In your new portrait you look as cute as your pups. This new recipe sounds sinfully delicious–a bread-y thing that even I might not ruin! This recipe looks amazing and I can’t wait to make it! 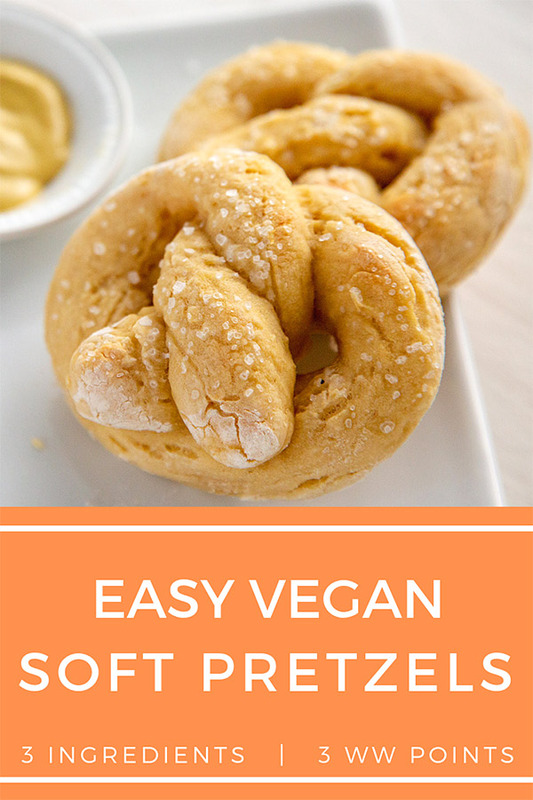 My husband loves pretzels and it will be fun to try these! 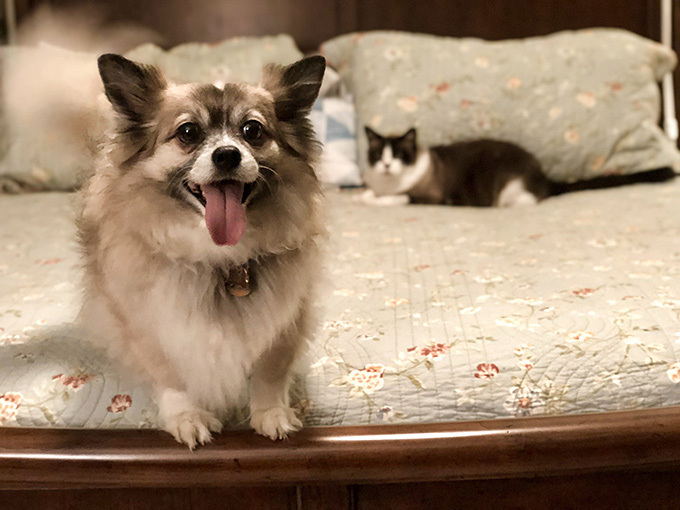 So sorry to hear about Bandit and thank you for sharing such great photos of your fur babies–all adorable! I joined WW in this past May when I saw that you were “pointing” some of the recipes on the blog as then I knew it would work for me. I found the earlier version was more difficult for a vegan and was delighted to learn through you that they had a new version. I have lost almost 30 pounds and still have some more to go, but many of my health issues are resolving. So I thank you from the bottom of my heart for passing the word along as does my family. Susan, I am so very sorry about your beloved Bandit. While I have lost pets I can’t imagine the pain of losing one in such a horrible manner. My heart goes out to you and will pray for you. I thought I saw Loki in the background and have often wondered how things are going. I have a cat that looks similar. That said I can’t wait to try this pretzel recipe. It is so brilliantly simple and it looks like it will taste great too. I hope you are able to blog more regularly soon. We genuinely care about you and love reading not only recipes, but anecdotes about your family and your fur babies. Hugs! Thank you for your sympathy, Cheryl. Yes, the way he died (and the suddenness) made it all so much harder to bear, I think we were in shock for quite a while. Thank you for reading and enjoying my posts. I will definitely try to write more often now that Salem is settling in. Wow! 55 pounds! That is truly impressive. Somehow, even as a relatively slim person, I’ve managed to gain 16 pounds in the last year. No idea why. Maybe I should give that a try…. 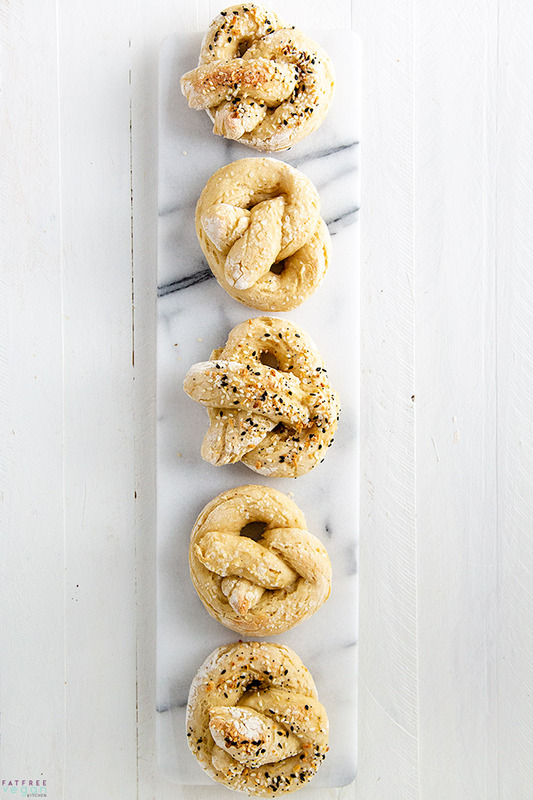 I'm totally making these pretzels this weekend, Thanks for the super idea! Plus it's a great excuse to use the coupon i just got on some kite hill chive cream cheese–my favorite!! Susan, I am very sorry for your loss. That kind of trauma is difficult to process. Hope your new family member is a comfort. Congratulations for your weight loss. What a relief, huh? Mine was 65 lbs 3 years ago,and I marvel at it every day to this day. Can’t wait to try the pretzels. Always a huge favorite of mine, and I just happen to have some everything bagel topping. Love your blog. Thanks for all your work. I’m deeply sorry for your loss and also glad for your gain. Salem looks adorable. Love the silken tofu idea. I need to eat gluten free and appreciate that those who comment leave helpful words of experience, recipe wise or other. The French bread idea caught my eye. Fun things to try! Thought these were going to be a fail but I baked them anyway because @susanffvk always has reliably wonderful recipes. And these were so delicious! Yummy warm pretzels in less than an hour! Two thumbs up from @jsasek That isn’t easy to get! Thank you for the review—and for being the first to try them! So sorry to hear about your dog being killed, he was part of your family. That must have been horrible. I think WW is great. I did it years ago and it made a huge difference in how I perceive food. Made me realize that vegetables with large amounts of fiber are filling and also quite tasty. It is a really healthy way to lose weight. Thank you for the recipe been craving pretzels for some reason. Maybe it’s because I have found out that the lidl srlls them and they are vegan haha. I hwave read your blog and I find it very courageous that you share your emotions for all to read. That must have been very tough to do it’s a cruel way to lose a friend I hope the new friend will bring you all the best joy in the family and soothes the pain of grieving. Thank you so much for sharing the fact that you follow WW. I also follow their progtam but find it hard sometimes because of the beans f.e. that cost a lot of points. Maybe I should try to find more people online who are vegan and follow WW. Do you have some tips maybe you could help me with? Thanks again for the recipe and your share…wish you all the best. Susan, so sorry for this horrifying loss. I feel your pain. Wow. So glad you have this adorable new dog. I too do well on weight watchers. I tend to save points fo some wine at night. To each his own. Thank you for posting the points! results. You are a true inspiration to us all. I am so very sorry for your loss. We lost our furry baby boy on the 31st of Dec.. My heart is in pieces. I made these pretzels last night. I didn’t have the extra firm tofu, but had the Mori-Nu firm. I also used whole wheat flour, which is all I had. I had to cook them 15 mins. longer than what’s called for. Not sure if that had to do with the tofu and/or the wheat flour. They’re wonderful, and all gone. Great with mustard, and great with vegan cheez whiz.. I definitely will be making these again. Thanks! I’m so glad you enjoyed them and reported back on using whole wheat flour. The firm Mori-nu probably has a little more water than the extra-firm, but I would think that would be offset by the ww flour needing a little more moisture. So I don’t know why they took so much longer. Maybe you’re at a higher altitude? I’m happy they came out well anyway! First off, I am so very sorry about your sweet fur baby, I am completely sympathetic and know the heartache of losing a beloved pet. 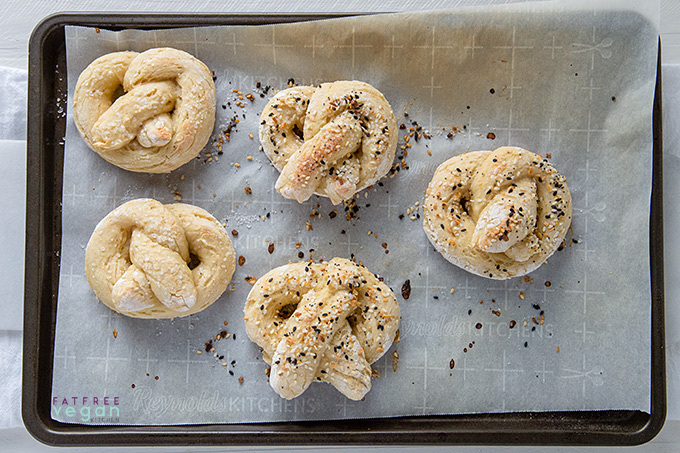 Second, these pretzels look amazing and I cannot wait to try them! Congrats on your success with WW ! That’s wonderful! I have a question about the tofu. Is your measurement by weight (with a scale) or is it by volume in a measuring cup? Thanks, Jill! For this recipe I used a whole box of silken tofu, which is 12.3 ounces by weight. When it was mashed, it measured 1 1/4 cups. If you used a different brand, you could measure it by weight or use 1.25 cups. First, I’m so sorry for your loss. Your new fur baby looks like a lovely part of the family. I’m going to have to try this, looks great. I’ll probably use a gluten free flour. I’ve also been using the WW app and program. I find it really easy to follow as a whole food plant based. I love getting new ideas from their boards. I’m down 10# in January! Congratulations on your weight loss and keep the recipes and points counts coming! Your success with weight watchers is awesome!! Congratulations! Although i wish you had felt like you could share that here to have extra support back when you started the program. I was so excited to try them, but then disappointed. I do not have self-raising flour, so used white whole wheat. They were doughy – not sure what I did wrong. i would like to try them again with sprouted spelt or a 60-40 baker’s blend that I have – andy comments? I’m sorry to hear that! I haven’t tried them with anything other than white flour. It could be that you’ll need to use less flour because it’s a heavier flour than white, but I also wonder if this sort of mixture with tofu just isn’t a good fit for whole grain flours. If you try again, please let me know your results. Finally got around to making these. Totally genius and totally delicious. Did it with the yogurt as soy Greek yogurt is hgh protein and cheap here in Europe. Turned out super fab. Make sure your surface and hands are really well-floured as it’s a wet dough. I might even do them as pretzel bites next time. So so yummy. Thank you for such a great post. I look forward to reading more and trying these pretzels in 2019. Ugh, sorry! I kept mine in a storage container in the fridge for 4 days, and they were fine. Did you use the same kind of tofu? I am so sorry for your loss. Thank you for sharing your stories with us. I found your blog years ago when I first became vegan. Your recipes were a life saver while navigating my new way of eating as I literally became vegan overnight. One of my first attempts at vegan recipes was your Zuppa Vegana: Italian Potato, Bean, and Kale Soup, which came out perfect! It is still in my regular rotation. 🙂 Since then I have made many other recipes from your blog and they never disappoint. Excited to give these pretzels a try. .